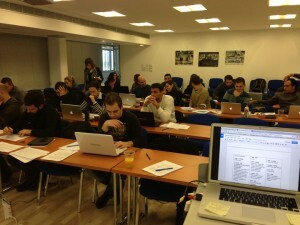 eDream's commitment to public outreach means sharing our expertise and learning from the expertise of fellow creatives. The Institute is dedicated to sharing a presence at major conferences as well as local, campus, and virtual events. We are also glad to serve as a source for recommending people working in digital arts media who might be best able to speak to particular areas of its contemporary theory and practice. Donna Cox presented the IEEE Vis 2015 keynote presentation entitled, “An Evolving Visual Language: Connecting General Audiences to Science through Data Visualization”. The talk and subsequent panel discussions were part of the broader IEEE VIS 2015, the premier forum for advances in scientific and information visualization. On Monday, 10 August, from 9:00 am – 11:00 am, Donna Cox & AJ Christensen will help lead a Birds of a Feather session entitled, “Immersive Visualization for Science and Research International”. This session focuses on immersive visualisation systems for science and research. It includes invited speakers and panel discussions on collaborative initiatives in creating open-source visualization and visual-analytics frameworks. Stuart Levy presented visualization excerpts from Solar Superstorms to the attendees of XSEDE2015 held in St. Louis, Missouri. AVL visualization programmer, Kalina Borkiewicz discusses "Color Design" with the Girls Engaged in Math & Science camp. "Ebert Center @ Illinois: Storytelling Meets Engineering"
SXSW: "Astrophysics Goes Hollywood: Cinematic Science"
Astronomical observatories like NASA’s Hubble and Spitzer Space Telescopes reveal our universe as never before. The amazing visuals they capture and dynamic results from supercomputer simulations, are perfect for large displays. This panel will discuss the art and science of transforming astrophysics data into cinematic movie sequences for NASA press releases, digital planetariums, and IMAX films. 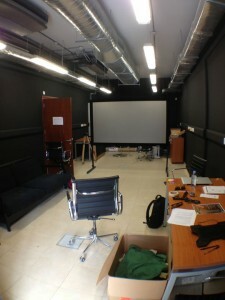 Such projects require ‘Renaissance teams’, fostering a deep collaboration between creative and technical participants. A combination of astrophysics research codes, Hollywood graphics software, and powerful computers are required to go from photons to pixels to voxels to animation. From interpreting the true 3D structure of our own Milky Way to envisioning the titanic collision of two galaxies to creating the spectacular journey into the Orion Nebula in IMAX “Hubble”, each production is guided by both accuracy and aesthetics. "Astral Projections of Big Data for Public Outreach"
eDream Director Donna Cox will discuss "Going Big with Visualization" for the 2014 Big Data Summit held November 5, 2014 at the i-Hotel and Conference Center. The panel will be moderated by Deana McDonagh, Designer in Residence at the Research Park. Panelists include: Colleen Bushell from NCSA, Donna Cox from NCSA and Hank Kaczmarski from the Beckman Institute. AVL/eDream team members present their work as part of a Birds of a Feather session at SIGGRAPH 2014 that focuses on immersive visualisation systems for science and research. The BOF brings together scientific visualisation practitioners from across the Globe in order to share their ideas and work in an informal atmosphere. The Invited speakers and discussion panelists spoke on collaborative initiatives in creating open-source visualisation and visual analytic frameworks, gaps and collaboration opportunities. The goal of this workshop is to recruit experts in art, science and engineering to discuss potential application of origami to real world engineering applications. The workshop will consist of brief lectures by all senior participants and will encourage discussion, interaction, and future collaboration. This event is funded by the Civil and Environmental Engineering Department and the Computational Science and Engineering (CSE) Program at the University of Illinois at Urbana Champaign. This workshop is held as part of a investigative thrust to explore potential research directions in Origami Engineering. Donna Cox was a featured speaker at the 34th Annual Tornado and Severe Weather Seminar held at the Ramsey Auditorium on the grounds of the Fermilab National Accelerator Laboratory in Batavia, IL Saturday, April 5th, 2014. Dr. Cox shared examples of data-driven visualizations including Hurricane Katrina, tornado formation as well as solar superstorms which impact the weather here on Earth. Don Wuebbles, The Harry E. Preble Professor of Atmospheric Sciences at Illinois and a user of NCSA's Blue Waters supercomputer, gave a talk called "Climate Change is Happening and It’s Affecting Severe Weather." The NSF-sponsored SEAD network held a series of events on May 16, 2013, co-hosted by the Smithsonian Institution, with a luncheon sponsored by the National Endowment for the Arts. SEAD will share results and seek feedback from an exploration of challenges and opportunities for transdisciplinary research and creative work, informed by 180 international participants. Next we will consider methods for innovative exchanges supporting cross-disciplinary learning across formal and informal education settings. Partner group XSEAD will then discuss designs for a 21st-century online portal to references and displays of work resulting from transdisciplinary collaboration. eDream director Donna Cox presented on a panel presenting an overview of XSEAD Initiatives. The network for Sciences, Engineering, Arts and Design (SEAD) is a community of advocates who are mindful that progress in the United States and our competitive edge in economic, educational, and social wellbeing rely on forward thinking as well as transformative efforts that span disciplines and domains. We support transdisciplinary, collaborative work integrating sciences, engineering, arts and design, fostering innovation to improve health, education, productivity and community sustainability. Colleen Bushell, a researcher in NCSA visual analytics group specializing in information design and software interface development. In addition to her role at NCSA, she is an eDream fellow and receives funding from the Mayo Clinic – University of Illinois Alliance. Her current interest focuses on the analysis and communication of genetic data and health information for clinical physicians, patients, and scientists. Her research explores the representation of uncertainty, context, probability and methodical inquiry. These concepts and research questions are applicable to other domains of information design. She will discuss challenges in these areas, her design methodology, and specific experiences from past work that guide her approach. Prior to her current position, Colleen was Director of Product Development and Design at RiverGlass Inc., an NCSA spin-off company that produced text analysis software. While at NCSA from 1986-2004 her work included data visualization for many scientific disciplines; design of the interface for Mosaic, the first Web browser; design of the first web-based office space created for Vice President Al Gore; and co-development of a visual programming interface for NCSA's data mining software. Colleen was also a tenured professor at UIUC in Graphic Design, and received the College of Fine and Applied Arts Outstanding Faculty Award in 1999. 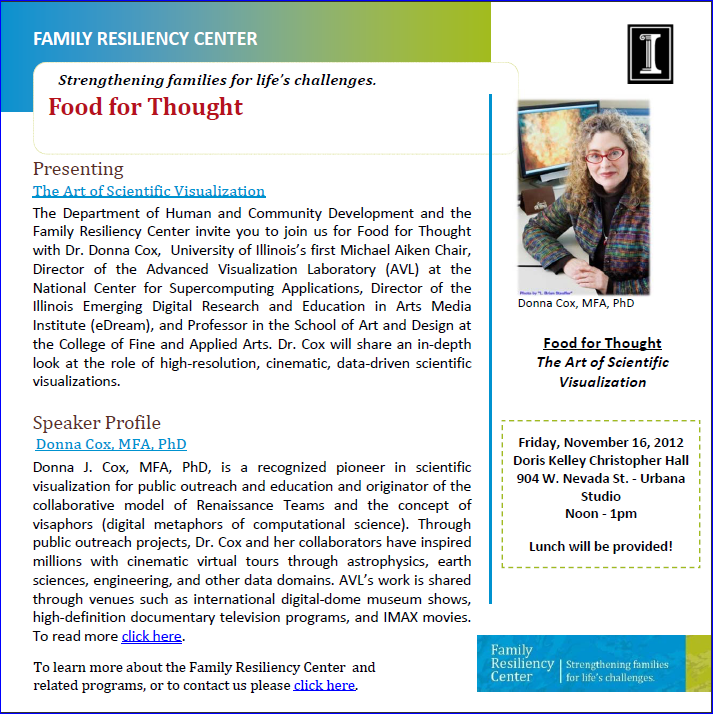 The Department of Human and Community Development and the Family Resiliency Center invite you to join us for Food for Thought with Dr. Donna Cox, University of Illinois’s first Michael Aiken Chair, Director of the Advanced Visualization Laboratory (AVL) at the National Center for Supercomputing Applications, Director of the Illinois Emerging Digital Research and Education in Arts Media Institute (eDream), and Professor in the School of Art and Design at the College of Fine and Applied Arts. Dr. Cox will share an in‐depth look at the role of high‐resolution, cinematic, data‐driven scientific visualizations. Jerry Fiddler, U of I alum, supporter of eDream, and principal of Zygote Ventures, has helped create and grow a number of companies, as CEO, director, chairman, investor, and advisor and gave a talk during NCSA's SPIN event at 4:30 p.m. in the NCSA Auditorium on Oct. 24. Mr. Fiddler discussed his philosophies on innovation and sharing his experiences as an interdisciplinary student. Mr. Fiddler is the founder of Wind River and was CEO and Chairman for 23 years. After its establishment in 1981 in Fiddler's Berkeley garage, Wind River grew to become the leading provider of device software worldwide, with over $400M in annual sales, and market cap well over $1B. He is now the Chairman of Solazyme, a biotech company working with algae for energy, industrial, and health applications. Solazyme is the first company in the world able to make production quantities of biodiesel and other algal oil products. NCSA is looking for Illinois undergraduate students who have big ideas and the creativity, skill, and drive needed to bring them to life. We're offering up to 15 paid innovation fellowships—selected students will work with NCSA mentors during the Spring 2013 semester. After the SPIN open house, submit your personal fellowship proposal. Selected students will be given office space and support to develop their ideas in collaboration with their NCSA mentors. Additional opportunities may also be available with NCSA and the Blue Waters project, the Illinois Informatics Institute, eDream, and the Illinois Institute for Computing in Humanities, Arts, and Social Science. The Adler Planetarium and the National Center for Supercomputing Applications at the University of Illinois co-host this behind-the-scenes presentation of Deep Space Adventure: The Searcher in the museum’s new Grainger Sky Theater–an ultra-high-resolution, digital projection system. Researchers will demonstrate innovative, jaw-dropping, time-evolving scientific visualizations driven by creative people and computing technologies. Hosted by: Donna Cox, Director, NCSA Advanced Visualization Laboratory. eDream director Donna Cox joins a group of artists, art enthusiasts, and activists to discuss how art is used as a medium for good, a method for inspiring change, or as a symbol of protest. How it can evoke a strong emotional response in many and nothing in others. CIW interprets the impact and influences of art with speakers: Petra Bachmeier, Carter Cleveland, Donna Cox, Phil Hansen, Naomi Natale, Carlos Javier Ortiz, Maida Swenson-Fortune, Tricia Van Eck. Panel discussion on "Earth Sciences in a Planetarium Environment"
eDream Associate Director for Production, Robert Patterson will join the panel to present "Earth in Motion—Visualizations for 'Dynamic Earth'"
Panel discussion on "BIG Data — What Are the Challenges Just What Is Possible?" The University of Illinois Silicon Valley Round Table cordially invites you to a reception and symposium featuring Vice President and Chancellor Phyllis Wise and speakers Donna Cox, Jerry Fiddler and Gene Robinson. Join us for an inspiring evening highlighting Illinois' leadership in interdisciplinary education. svrt@uif.uillinois.eduwith your name and your guest's name as preferred for name tag. Space is limited. Please reply early. Donna Cox will present a variety of interdisciplinary collaborations that cross the boundaries of art-science and provide stunning examples of an emergent field. She will also describe outcomes from the Illinois Innovation Summit and emerging academic models that involve collaborative interdisciplinary research and student-centric, project-based education. The goal of these new approaches is to address global challenges through academic transformation. Higher education should afford students with an opportunity to explore problems that require an interdisciplinary approach to their solutions. Clearly universities must train physicists, doctors, farmers, etc. but we must also develop skills to understand the world in new ways. Some students should be enabled to organize their education around compelling problems, rather than strictly around existing disciplines. Jerry will describe his educational journey and the ways in which he shaped his experiences while on the campus to meet his unique interests and acquired skills to address important problems through both science and the humanities. Society’s most compelling challenges and transformative advances in energy, food, health and the environment will increasingly involve the life sciences. The centrality of biological knowledge in all facets of modern life requires that every citizen become “bio-literate.” Gene will discuss how Illinois can distinguish itself and lead the nation as a public university with a novel mandated bio-literacy program for all undergraduates, featuring courses that weave biological information into the fabric of diverse disciplines and drawing upon the activities of new interdisciplinary campus research institutes. Donna Cox will present eDream and the Advanced Visualization Laboratory (AVL) collaborative scientific visualization projects for public outreach and education. She will provide an overview that includes visualizations for museum shows, IMAX films, and television. These shows include collaborations with the California Academy of Science, IMAX corporation, Krannert Center for the Performing Arts (“The Great Flood”) and work in progress on “Dynamic Earth” at the Denver Museum of Nature and Science. She will focus on the ‘making of’ Hubble 3D IMAX movie where she and her team worked with the IMAX Director, Toni Myers (Blue Planet, Destiny in Space) to develop and choreograph the virtual flights through awesome Hubble data. The IMAX film is narrated by Leonardo DiCaprio and was released April 2010. It has been translated into more than 14 languages and shown to more than three million people world-wide and won the Giant Screen awards for best film, best cinematography, and best life-long learning. "The MusiVerse Makers: Dreams of Aesthetic Gaming"
Dr. Ben Smith formulates a trajectory through the aesthetics of interaction and gaming as embodied by the MusiVerse, an ongoing research project into the potentials for expression in virtual worlds. This original synthetic environment explores notions of presence, representation, music, and modes of control, instigating a series of projects and public performances staged over the last five years. Developments in human-computer interaction, artificial intelligence, and real-time animation support this inquiry which seeks to understand the unique expressive affordances of the video game. Donna Cox gave keynote at the Illinois 4-H State Fair awards ceremony for the Illinois 4H-Film Festival and Map Gallery. This event hosted by the 4-H SET (Science, Engineering, and Technology) Division, University of Illinois Extension Office and Dr. Lisa bouillion Diaz. Dr. Donna Cox gives keynote to the Women in Computer Science annual banquet. The WCS Annual Awards Banquet is an opportunity to celebrate the accomplishments of Women in Computer Science. eDream director Donna Cox will give the keynote. Siebel Scholars will be treated to a private viewing of Hubble 3D inside the Navy Pier IMAX theater. Dr. Donna Cox―Director of the Advanced Scientific Visualization Laboratory at UIUC; Director or Visualization and Experimental Technologies at the National Center for Supercomputing Applications (NCSA); and Director, edream (Illinois Emerging Digital Research and Education in Arts Media Institute)―will provide an overview of the technical details behind the making of Hubble 3D. Recently, the University of Illinois established a new interdisciplinary Informatics PhD that enables students and faculty to design research that can cross the boundaries of art and science https://www.informatics.illinois.edu/display/infophd/Home. This forum presents this new PhD and other research opportunities at the Center for Transformative Climate Solutions and the Illinois Sustainability Technology Center. Robert Patterson & Donna Cox, CineGrid Workshop, “Scientific Visualization: domes, large-format, 3D”. Donna Cox to give the keynote at Cyber Infrastructure Days at Purdue University. 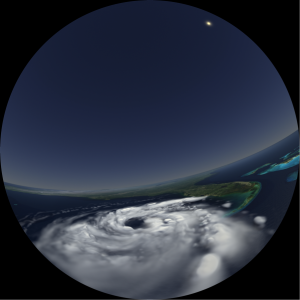 Donna Cox to serve on a panel on fulldome scientific visualization at IMERSA (Denver, CO: Oct. 26-29). Donna Cox participated in a summit between NEA and NSF exploring possibilities for shared funding for cross disciplinary research collaborations in Art and Science (Washington DC). Donna Cox particpated in a SIGGRAPH panel on Grand Challenges in Education (Los Angeles), organized by Leonardo head Roger Malina. The panel took up the conversation started in HASTAC founders and leaders David Theo Goldberg and Cathy Davidson's Macarthur Foundation-funded report The Future of Learning Institutions in a Digital Age (MIT Press, 2009). Donna Cox was just one of 120 participants in the National Science Foundation's Broader Impacts for Research and Discovery Summit, held in Washington DC. The summit produce a new set of review guidlines that will impact Computer Information Science & Engineering (CISE) awards. The creative team behind Astral Convertible, including John Toenjes of Dance and Alex Betts of the Advanced Visualization Laboratory, presented their work at the Krannert Center for the Performing Arts Tech Summit. As Toenjes writes, the performance was "reconstructed, reinspired, reinvented." Mary Pietrowicz presented two papers on behalf of the Cultural Computing Group and IACAT at CHI 2010 (Atlanta, GA). "Multimodal Gestural Interaction in Performance," co-authored with Robert E. McGrath, Guy Garnett, and John Toenjes, was presented to the Whole Body Interfaces Workshop. "A Framework for Enabling Multimodal Gesture Interaction," co-authored with Robert E. McGrath and Guy Garnett, was presented to the Natural User Interfaces Workshop. eDream Director Donna Cox presented at two TEDx events held on the University of Illinois campus: TEDxUIllinois and TEDxUIUC. TEDx events are licensed local spinoffs of the international TED phenomenon, which promotes "big ideas worth sharing." Kelly Searsmith, Ph.D., presented "assembly required: transformative arts projects from the trash heap of civilization" at the Pecha Kucha CU @ The Canopy Club. The presentation argued for the utopian potential for digital arts media projects to reconnect and rehumanize, theorizing specific approaches by which they do so and giving examples drawn from the last decade to the present. Over 400 people attended. Bob McGrath Ph.D., of NCSA, and Mary Pietrowicz M.S., of IACAT, presented mWORLDS, a research project headed by Roy Campbell Ph.D. and Guy Garnett D.M.A., at SLACTIONS 2009: Research Conference in the Second Life World: "Life, Imagination, and Work Using Metaverse Platforms." The presentation served as an opportunity to talk through and test technologies that could be used to support the all-virtual HASTAC 2010, which will be led by ICHASS, in April of next year.